A robust risk management strategy is pivotal for the insurance firms given its background of low-interest rates, unstable market, and depressed returns. With insurance firms falling prey to varying regulatory reporting and data management issues expansion of digital platforms such as smartphones and their applications have proven themselves to improve their risk management capabilities. Insurers are also inching towards the technology of connected devices or Internet of Things (IoT) to curb the risks and fraud insurance claims. IoT expands the horizon of measuring and mitigating risks, using data from automotive sensors, wearable fitness trackers, and telematic devices, by automatically detecting the damage and triggering the restoration process without any manual interference. Apart from IoT, AI-powered risk management systems have also come up allowing insurers to recognize and alleviate cyber attacks. AI makes use of algorithms that study data patterns in order to recognize fraud insurance claims. AI-powered Intelligent Robotics is also making headway into the insurance industry that uses advanced analytics to detect insurance claims by legit and genuine customers. Furthermore, to align with the shifting regulatory compliances employing an integrated approach to risk management such as Enterprise Risk Management (ERM) can help insurers develop efficient operations to cope up with the regulations. With the intention of guiding insurance industry firms to upgrade their risk management security systems, a distinguished panel comprising of eminent CEOs, CIOs, VCs, and analysts along with the editorial panel of Insurance CIO Outlook have crafted out a list comprising of Top 10 Risk Management Solution Providers of the year 2018. 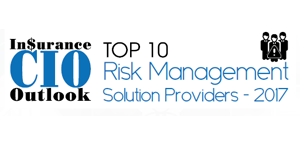 We present to you Insurance CIO Outlook's "Top 10 Risk Management Solution Providers - 2018"